Glaciers top the list of things that visitors to Alaska want to see. There are not many other places where you will see so many. In fact, if you put all of the glaciers in the Lower 48 together, they wouldn't be as big as just one of Alaska's biggest glaciers. Since glaciers form high in mountains where more snow falls than melts, it is no surprise that Alaska, with its tall mountain ranges, has so many glaciers. Glaciers are often described as flowing rivers of ice. Actually, glaciers are more than just ice. They are made up of snow, ice, and rock that build up over years in mountains where more snow falls than melts. Gravity pulls these often very large, heavy, and deep frozen slabs down slopes from the mountains where they form. Why do some glaciers look blue? The dense and highly compacted ice of glaciers appears blue because that is the only color that is reflected. All the other colors are absorbed by the glacier. Tidewater glacier is a glacier that ends in the ocean, saltwater bay or fiord. Piedmont glacier is a glacier that forms when one or more glaciers flow down from mountains into valleys and spread out in the lower level ground. Scientists say that Alaska has about 100,000 glaciers. Only about 650 of them have been named. 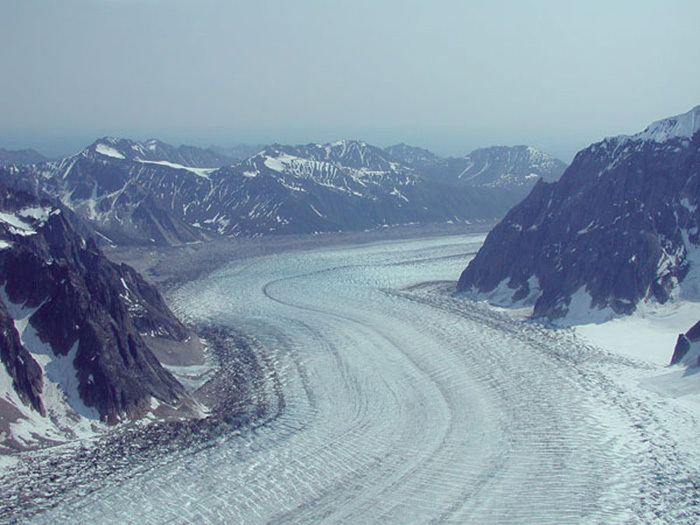 The longest tidewater glacier is the 76-mile long Hubbard Glacier. The distance between Anchorage and Girdwood is only 37 miles, so think about a glacier that is twice the distance between Anchorage and Girdwood. This glacier grew rapidly, or surged, twice not that long ago. In 1986 and again in 2002, it grew long enough to block the entrance to Russell Fiord. 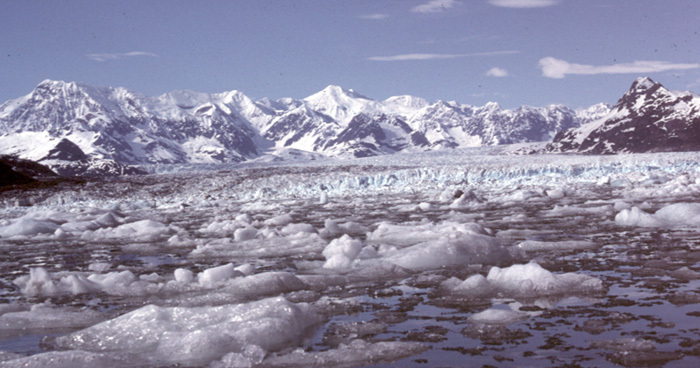 The largest glacier is the Bering Glacier complex near Cordova. This glacier covers 2,000 square miles, including the Bagley ice field. That is bigger than the state of Delaware. 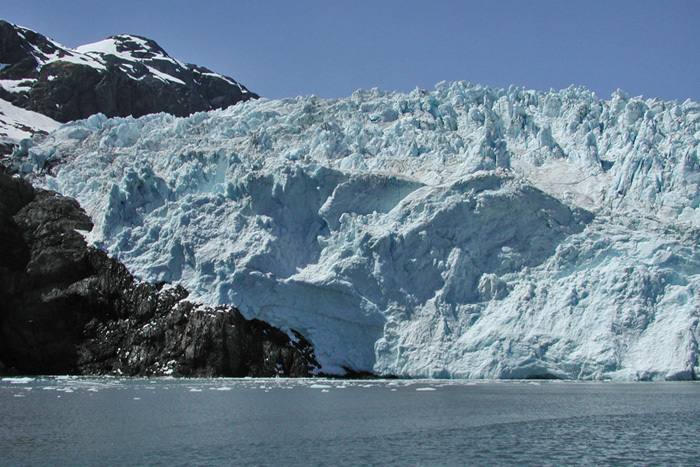 Prince William Sound has more active tidewater glaciers than anywhere else in the world. 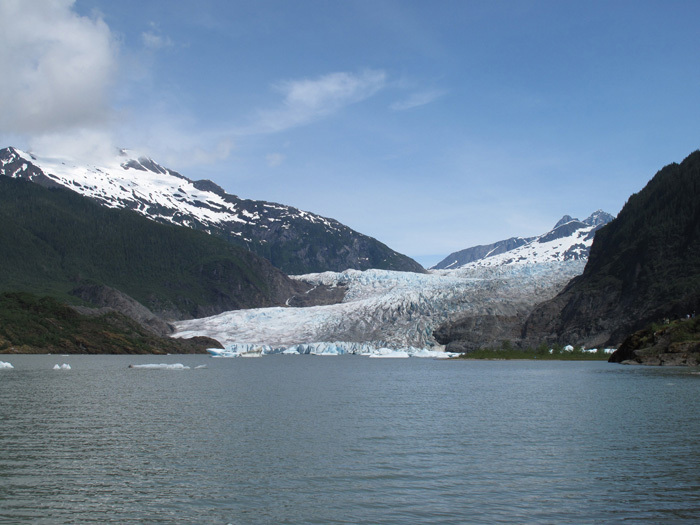 Visitors can see at least 20 glaciers in a one-day boat tour of the area. The largest piedmont glacier in the world is the Malaspina Glacier. The 850 square-mile glacier formed in the St. Elias Mountains. This is nearly the size of the state of Rhode Island. 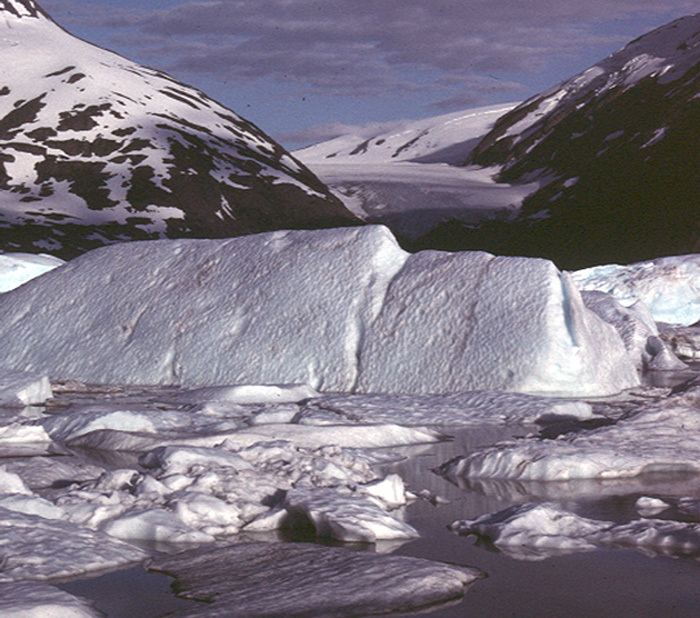 The most visited glaciers in Alaska are the Mendenhall in Juneau and Portage south of Anchorage. Both glaciers have gotten much smaller. When the visitor center at Portage was opened in 1986, you could still see the glacier from the center. Now you might see icebergs floating in the lake.